It all began some time in the early 60′s at New York’s famous club The Village Vanguard. Burt Britton was tending bar, subbing for a friend, and one customer kept asking for more. 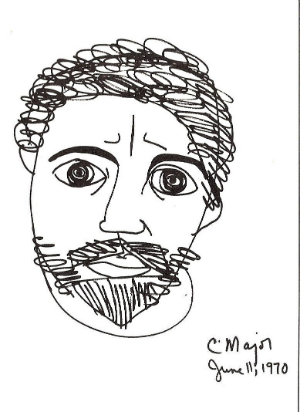 It was Norman Mailer. Britton tried to shoo him away, but Mailer kept asking for drinks and saying, “What do you want from me kid?” In a flash of inspiration, Britton shoved a napkin Mailer’s way and asked him to draw a self-portrait on it. 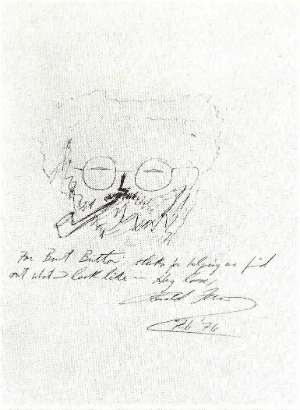 “That,” says Britton, “was how the madness began.” By the time he published Self-Portrait: Book People Picture Themselves (1976), he had hundreds of these informal portraits from some of the most prominent writers, actors, and artists of our time. I wrote about Self-Portrait in “Self-Portraits of the Artists,” where you can get more of the remarkable story. 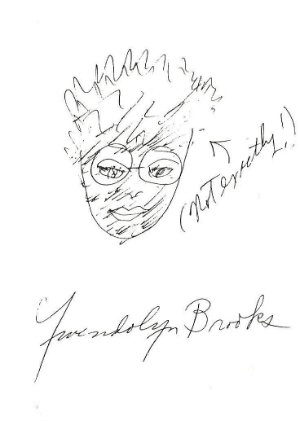 Given the interests of this site, I was delighted to find self-portraits of ten of the black writers I write about here and wanted to show some of these, beginning with Gwendolyn Brooks above. Four of the ones I present here are included in my book Black Writing from Chicago: In the World, Not of It? Go to my articles about them through the links that follow. 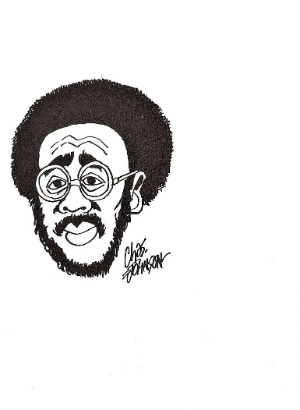 After Gwendolyn Brooks, the self-portraits running down the left side of this post are from Charles Johnson, Ronald L. Fair, and Clarence Major. 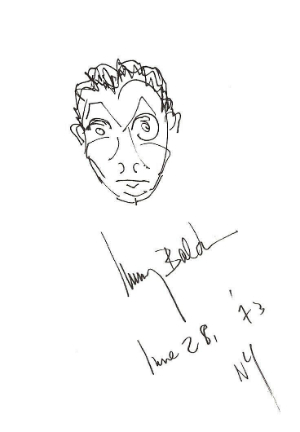 There’s a fifth self-portrait here as well, someone not included in Black Writing from Chicago, but certainly mentioned there and, I think, in most things I’ve ever published. It’s James Baldwin. I find it amazing how well each writer here has captured his or her essence, not just the essence of their styles, but their very looks themselves. All of them, but especially for me James Baldwin. 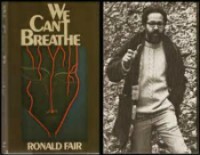 In “Black Writers Picture Themselves – Part 2″ (link goes live when that post is done), I show five more self-portraits with links to my writing about them. The five will be Maya Angelou, Ralph Ellison, Leon Forrest, James Alan McPherson, and Toni Morrison. 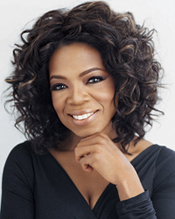 ♦ Go to a list of Black Writers on this site, and to the Teaching Diversity main page. There’s much more on the so-called “Third World” today, though it’s still mostly out of sight, out of mind for most Americans, except for its association with terrorism and, currently, as a place where all those “sh*t hole countries” are. 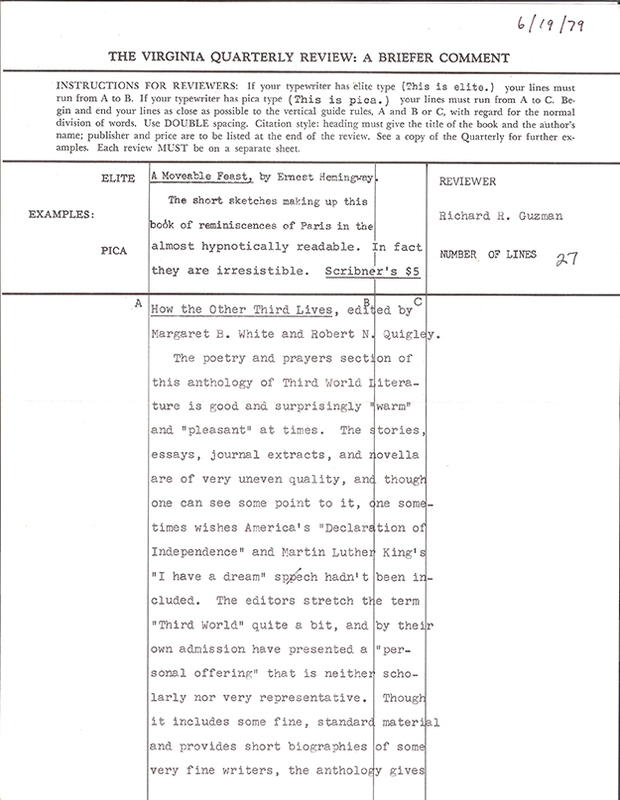 In 1979, when I wrote the following “Briefer Comment” for The Virginia Quarterly Review, there was far, far less available, and the “Third World” was further out of sight. 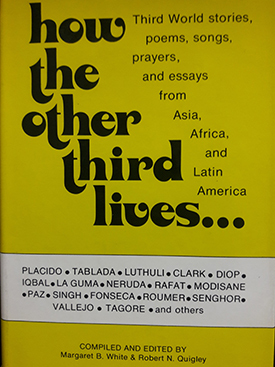 I’m perhaps harder on the book than I should be, but even then I sensed that How the Other Third Lives—an anthology of “Third World” prayers, songs, and literature edited by Margaret B. White and Robert N. Quigley—was one of the first attempts to bring that area of the world into the popular imagination and connect it to our “First World” history. As a regular part of my teaching load, I’ve now taught “Third World” literature, culture, politics and economics for over 40 years. For more about the “Third World” on this site—including why I persist in using that term—go to “The Third World,” and to “The ‘Third World:’ A Course Overview,” which contains, at the end, a VIDEO overview of an interdisciplinary graduate course I have taught for many years. My first big articles, those that established me as a writer and scholar, were on the “Third World” writers N.V.M. Gonzalez and Raja Rao. These two essays form the foundation of a developing page on WORLD WRITERS on this site, a page devoted mostly to “Third World” writers, but also to the enormous area of World Writing itself, an area—whether “Third World,” French, Australian, Canadian, etc.—we also need to know more about. Despite current politics, globalization isn’t going away. On this World Writers page you’ll find this link: POST-COLONIAL WRITING IN ENGLISH: A WRITER’S LIST. This post reports on The Arnold Anthology of Post-Colonial Literatures in English and provides a pdf of the Table of Contents, so you can at least catch a glimpse of the richness of just the names themselves. It’s a much, much bigger book than How the Other Third Lives, and much more inclusive and scholarly, too, even though it confines itself to “just” writing in English. One reason globalization isn’t going away is the English language itself. 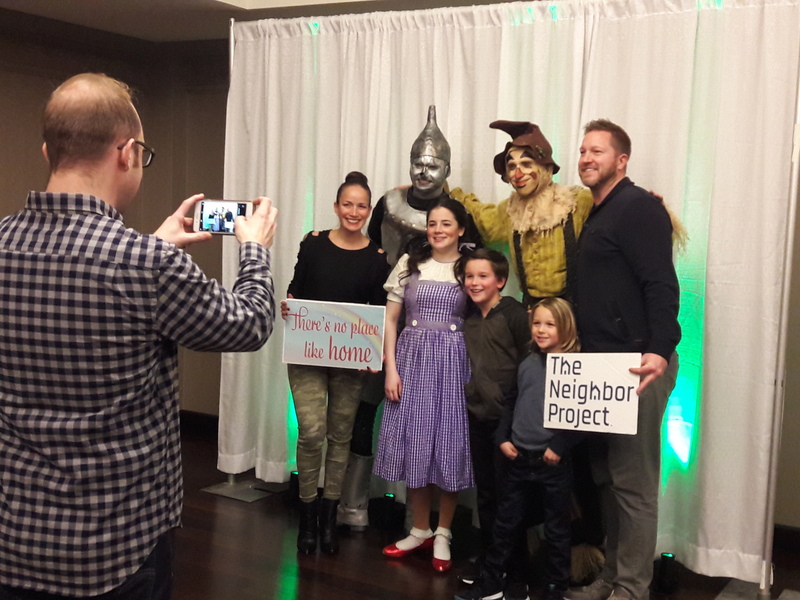 Our thanks to everyone who has supported The Neighbor Project, an organization created in April of this year when Emmanuel House and The Joseph Corporation merged. It helps families get out of debt, save money, and buy a home (or keep one out of foreclosure). That home is an asset that opens doors to stability and financial and educational opportunities that change the trajectory of a family’s life, as well as the life of the neighborhood it lives in. The result: a better community for all of us. Homeowners stay in neighborhoods 4x longer. Their children are 25% more likely to graduate from high school, and more than 115% likely to graduate from college. 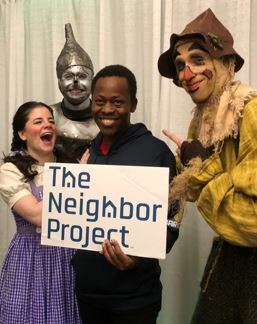 Find out more about The Neighbor Project and get involved. 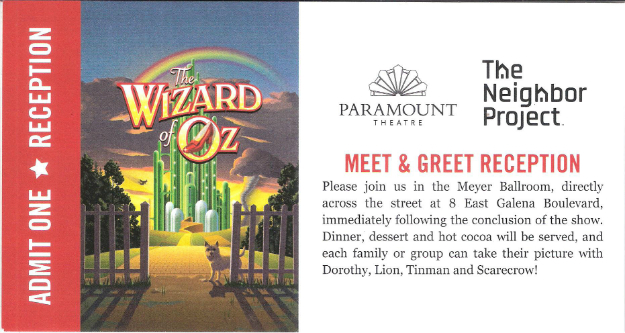 Finally, our thanks to The Paramount Theater, and to the stars of The Wizard of Oz—Elizabeth Stenholt (Dorothy), Kyle Adams (Scarecrow), Carl Draper (Tinman)—for their wonderful performances in a spectacular show, and for their generosity in spending so much time and giving such warm enthusiasm to The Neighborhood Project’s staff, supporters, and families afterwards. What momentum it built for another year of helping families and neighborhoods. Note: A family emergency kept Paul-Jordan Janzen (the Lion) from joining us after the show. Our best wishes to him.